In tandem with the imminent conclusion of the 125 Anniversary Celebrations Kilmeena G.A.A. will host a Dinner Dance on Saturday 21 February @ 7.30 p.m. in the Castlecourt Hotel with music for all age groups provided by renowned D.J. Mr. Henry Mc Glade. Tickets € 25 each and a concession of € 15 each for Leaving Cert and third level students, will be available from the Club Officers and 125 committee members. 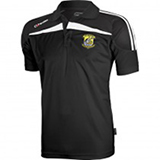 Tickets can also be purchased at Registration Night on Sunday 8th February from 8.00 p.m. – 9.00 p.m. in the Clubroom. The Club’s Annual Awards for Young Player of the Year , Community Award and Club Person of the Year will be presented by one of our celebrity guest speakers, Mr. Mike Connelly, Chairman of Mayo Co. Board. 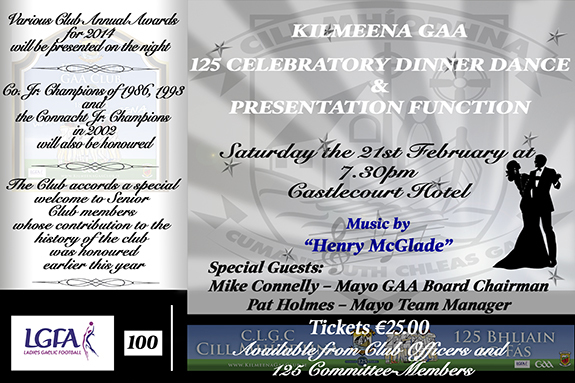 The 125 Anniversary of Kilmeena G.A.A. Club was marked by many notable events which proved very successful and generated a very positive response from the community. In order to complete this milestone in the history of the Club the ultimate accolade has to be attributed to the Co. Jr. 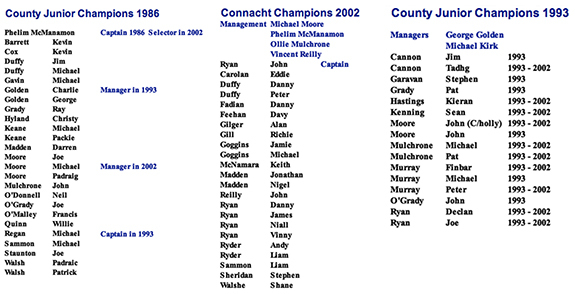 Champions of 1986, 1993 and the Connacht Jr. Champions in 2002. So Gentlemen, dust down the suits because Mayo Manager, Mr. Pat Holmes, will be present on the night to make the presentation to all of you that featured at all levels on each panel, including management. There are 69 in total and the list of each panel is included here. As a number of players have emigrated it would create an indelible family memory if a parent or sibling could be there to accept your presentation. 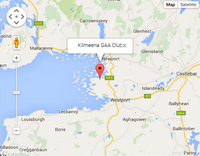 The Club also accords a special welcome to Senior Club members whose contribution to the history of Kilmeena G.A.A. was honoured earlier in this Anniversary year. To facilitate the Castlecourt Hotel with numbers, the 125 Committee and Club Officers require confirmation of your attendance by Saturday 14th Feb. Now there’s a date to remember! !